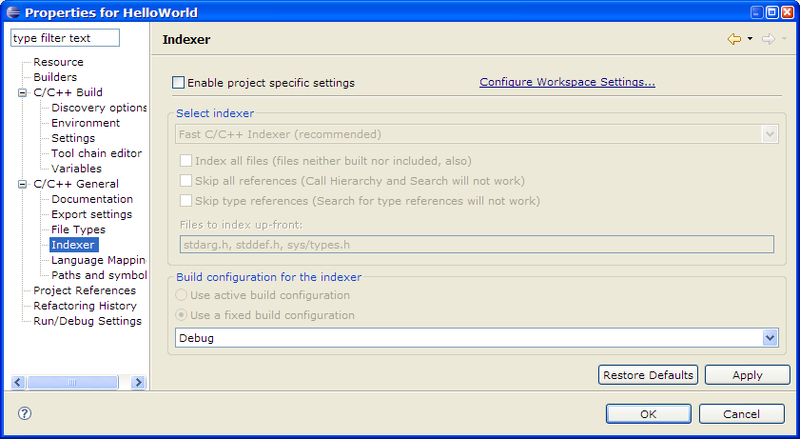 You can select which C/C++ Indexer to use for your project. The indexer is necessary for search and related features, like content assist. Check this box if you need specific index settings for this project. Else common settings (defined in Preferences) will be applied. In this case, all controls below are disabled. Specifies the Indexer to use for this project; No Indexer disables indexing. Every indexer may have its own set of options. Index source either from specified configuration, or from active one. Since indexing takes a lot of time, using active configuration is not recommended, because re-index will be fired after each active configuration change.